China’s chengguan, or urban management officers, non-police who are charged with such urban tasks as clearing away unlicensed street vendors or carrying out forced demolitions, have a horrible reputation in the country. Their name is synonymous with violence. But recently, the southern city of Guangzhou issued new regulations for its chengguan designed to spruce up their public image. Chengguan are now being told, for example, that they must begin interactions with the public by saying “Hello!”. 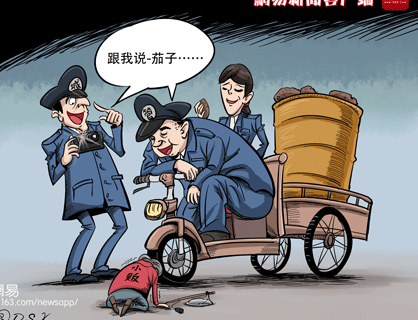 In the following cartoon, posted by artist DSX (大尸凶的漫画) to Sina Weibo, three chengguan officers pose with an elderly street peddler who is forced to kneel on the street (presumably before they confiscate her goods). “Say ‘Cheese’!” they tell her tauntingly. The not so subtle sub-message: training chengguan in politeness is pointless and beside the point when they are tasked with the oppressive dirty work police want to keep at arm’s length. NextWho watches CCTV Nightly News?